Sports betting game TIPPMIX, a product of Hungary’s national lottery, Szerencsejáték Zrt., will be the title sponsor of this year’s WOMEN’S EHF FINAL4. 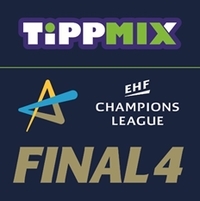 The event’s official name will be the TIPPMIX EHF FINAL4 2017, with the Papp László Sportaréna in Budapest playing host on 6/7 May. The title sponsorship was announced in Budapest on Wednesday at the Elek Gyula Arena ahead of the Hungarian domestic league match between WOMEN’S EHF Champions League participants FTC-Rail Cargo Hungaria and Győri Audi ETO KC. “For us, women’s handball in general, and in particular the EHF FINAL4, has always been a safe bet when it comes to arousing sponsors’ interest. With Szerencsejáték Zrt. and TIPPMIX we have secured a title sponsor which is already active in the sport and we are looking forward to a successful cooperation,” said EHF Marketing Managing Director David Szlezak. “2017 will be the fourth edition of the WOMEN’S EHF FINAL4 in Budapest, and we are very happy that we acquired Szerencsejáték Zrt. as the title sponsor of this showpiece event. We have had a fruitful cooperation with the company in recent years and the agreement for the EHF FINAL4 marks another milestone for women’s club handball,” said Hungarian Handball Federation President, Máté Kocsis. “Handball is a highly popular sport in Hungary and also in Europe. Hungarian teams regularly play in the final phases of EHF competitions. The WOMEN’S EHF FINAL4 in Budapest is the top-ranked women’s club competition on the continent. This is also an exceptional opportunity for Szerencsejáték Zrt. to popularise its betting product, TIPPMIX, through handball, since handball fans are enthusiastic spectators and sports experts. Two Hungarian women’s teams play in the Champions League and we truly hope that we can cheer for both of them in TIPPMIX EHF FINAL4 in May,” concluded Dr. Márton Braun, President and CEO of Szerencsejáték Zrt. “We are committed to further developing the event and we are preparing an unforgettable show this year. Ticket sales are running better than we expected with thousands already sold. It is worth hurrying up to get the best seats in the arena,” said HHF Vice President, Katalin Pálinger. Up to 12,000 spectators will be present on 6/7 May when the four best teams battle it out for the coveted WOMEN’S EHF Champions League trophy. Tickets have gone on sale and can be purchased via the official website www.ehfFINAL4.com. The WOMEN’S EHF Champions League brings together the leading clubs and top players in Europe’s premier women’s club handball competition. 16 teams are competing from September through to May for the chance to qualify for the season’s highlight, the TIPPMIX EHF FINAL4, which will take place on 6/7 May 2017 in Budapest’s Papp László Sportaréna. More information at www.ehfCL.com and www.ehfFINAL4.com. Szerencsejáték Zrt.is the Hungarian national lottery company and under Hungarian law, exclusively sells and markets lottery, lottery tickets, football pools (Totó, Góltotó), sports betting and has the exclusive right to organise bookmaker-type sports betting (e.g. Tippmix, TippmixPro) on the Hungarian territory.